THE RESISTANCE MOVEMENT SEEN FROM THE PERSPECTIVE OF FAMILY DRAMA / COMEDY. THE FAMILY AS A METAPHOR FOR FRANCE. 'The life of a French family during the Occupation'. Released only a few months after the success of Battle of the Rails, this movie shares that film's focus on the Resistance, but its perspective is completely different. The film was apparently the brainchild of the well-known comedian Noel-Noel, popular in the 1930s and 1940s for his film and stage roles. Noel-Noel wrote the script and may have shared direction with Battle of the Rails director, René Clément. Le pere tranquille is comedy-drama firmly set within the context of the Martin family. As the opening credits declare, the movie is about 'The life of a French family during the Occupation'. The father, Edward, appears to be a quiet, unassuming man whose hobby is growing orchids. In fact, his family is unaware that he is an important Resistance leader who clowns around in the presence of Nazis. The teenage son is angered by his father's apparent complacency, eventually running away to join the Resistance. Edward's daughter, however, gradually comes to realize what her father is up to and helps him organize a risky operation. Le pere tranquille has a pleasing balance of comedy, tension and family drama with a touch of romance. Noel-Noel is particularly convincing as the apparently quiet and unheroic father who is actually a brave and resourceful man. Noel-Noel (real name Lucien Noel) was a popular French comedian whose movie and performing career lasted from the 1920s to the 1950s. He started his comic acting career in the 1920s, performing in music halls and cabarets, where he developed the persona of a hapless soldier, Ademai. He then moved into movies. By the 1930s he was making a series of popular comedies based on Ademai's mishaps and exploits. That character remarkable resembled Jerry Lewis's persona in his films of the 1950s and 1960s: indomitable, not too bright, well-intentioned, , hapless but loveable. And like Lewis, Noel-Noel was more than an actor. He wrote screenplays and satirical songs and may have directed or co-directed Le pere tranquille, which appears to have been one of his personal projects. Noel-Noel was also a political cartoonist on the left. The drawing on poster at left is his work. Noel-Noel's performance in Le pere tranquille shows the range of his acting skills, for he cleverly portrays a paternal figure who conceals a courageous and steely will underneath a facade of acting foolishly in the presence of Nazis in order to conceal his identity as a key Resistance figure. 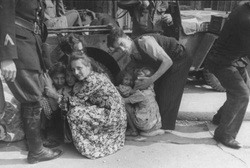 Picture at left shows members of a French family being protected by Resistance forces from a German sniper attack during LIberation. The same sense of family solidarity and Resistance bravery can be found in 'Le pere traquille'. The crucial symbol in Le pere tranquille is that of the family. Most of the film concerns the activities and relationships of the Martin family, which becomes a metaphor for the French nation. By the end of the film, all the members of the family, including the son who wants to join the Resistance unaware that he is father is a leading member, and the daughter who comes top realize the truth about her father's double identity and assists him in a plot against the local German occupiers. Even the daughter's would-be boyfriend is a Resistance member. The family / France is thus depicted as united in its opposition to the Occupation and bravely taking steps to resist and overcome the Nazi invaders. The film shows the Resistance as united, clever and well organized, while the Nazis are essentially stupid and unable to cope with French courage and ingenuity. Le pere tranquille, then, like Clément's Bataille du rail, provides a cinematic template for what became the longstanding Gaullist portrayal of a nation determined to resist its German occupiers. 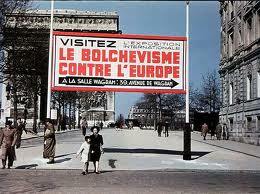 In 2008 the Paris History Library put on an exhibition called 'Paris Sous l'Occupation' (Paris under the Occupation). It consisted of 270 color photographs taken between 1941 and 1944 by a French photographer, André Zucca. They showed individuals and groups, Parisians and Germans, in the streets of Paris. Before the war Zucca's images had appeared in both French and international magazines. During 1939-40 he had covered the Russian-Finnish War for Paris-Soir. During 1941-44 he worked for Signal, which happened to be a German propaganda magazine and which published most of the images that appeared in the 2008 Exhibition. The Exhibition struck a blow at the views projected by Le pere tranquille, with Frenchmen united in working against the hated Nazi occupiers and doing their best to overthrow them. Instead, Zucca's images provided proof that Parisians carried on their lifestyle, unperturbed by the Occupation. They show daily life proceeding as normal, despite the presence of German troops, and buildings decorated with swastikas and taken over by Nazi institutions such as the S.S. Zucca's photos suggest that Parisians carried on as usual,unperturbed by the presence of German military and Nazi institutions. The photos show Parisians drinking, eating, shopping, talking, sunbathing, flirting - activities in which the Germans also participated without any sign of rancor or dissent from the French. In short, the Exhibition suggested that Parisians accepted the German Occupation with equanimity, Only one image suggest that something terrible was going on in the background: an older Frenchwoman walking down a street wearing the Star of David on her coat. The opening of the Exhibition caused an uproar. Officials were embarrassed that it showed French people going about their daily lives as usual, oblivious of the Nazi presence and of the fact that during this time thousands of Jews were being arrested and deported to concentration camps. The Paris Mayor and city council ordered that posters advertising the Exhibition be removed and that an historian add 'explanations' to the photos' captions. The uproar shows how deeply entrenched were the Gaullist stereotypes, found in Le pere tranquille, of the French nation united in opposition to the Occupation and struggling bravely to overthrow the hated invaders. Zucca was arrested for collaboration after Liberation. However, he was never prosecuted and became a wedding and portrait photographer until his death in 1973. After all, Zucca did no more than millions of his fellow French citizens had done. He accepted the Occupation, used it to further his career, and turned a blind eye to the evils that Nazis were openly committing. 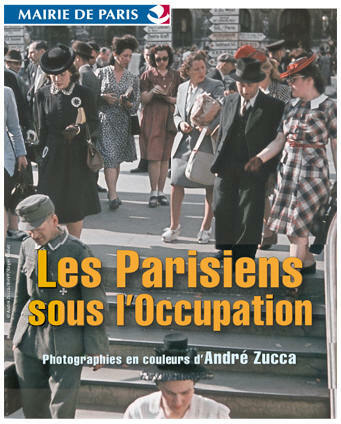 There is no evidence that Zucca assisted the Germans apart from taking photos demonstrating the fact that most Parisians tolerated the Occupation rather than opposed it - until it became obvious in 1944 that the tide of war had turned. Poster advertising the 2008 Exhibition. 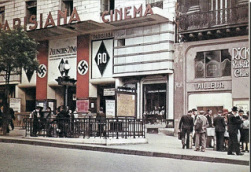 Parisians attended Nazi propaganda exhibitions and displays in Paris. 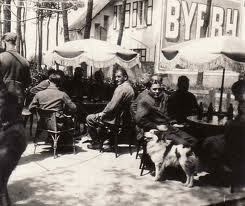 German troops and Parisians enjoying the café lifestyle during Occupation. Signs of the German Occupation became part of the Paris landscape. 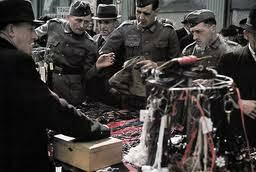 German soldiers shopping at a Parisian market. 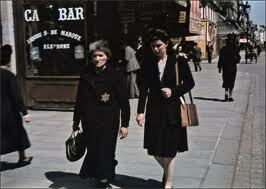 Jewish woman wearing Star of David in Parisian street. 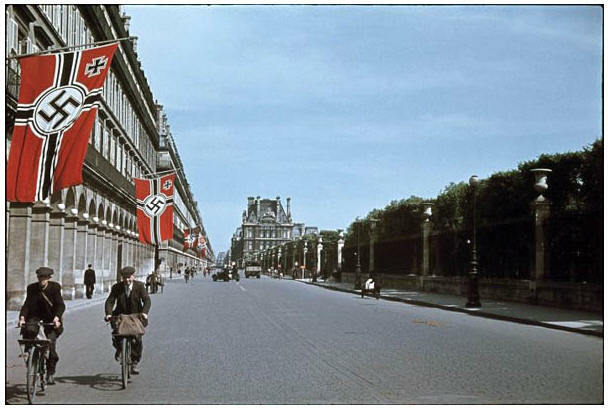 Parisians cycle past the infamous S.S. Headquarters at Hotel Meurice on the Rue de Rivoli. 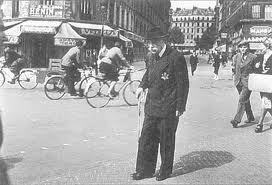 Elderly Parisian Jew wearing Star of David, 1942 [Collections Gulliver, 1993). Not one of Zucca's photos.